India holds prominent status for its capabilities in the outsourcing of information technology (IT) services; it accounts for about 67 percent of the global outsourcing market. 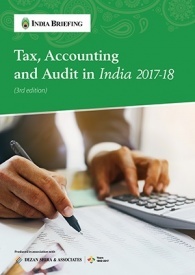 Drawing investor appeal is India’s ecosystem of skilled professionals with English language fluency, high-quality infrastructure (connectivity, business centers, and educational institutions), and supportive government policies. 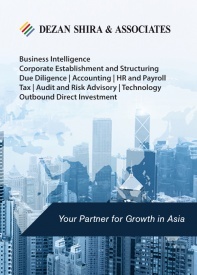 Moreover, building upon its early outsourcing legacy, India is now evolving into a value-added destination – making cost-efficient technology for global clients and opening new industry verticals in the fields of system integration, consulting services, and technology-enabled business services, popularly known as SMAC. While leading multinational Indian firms such as Tata Consultancy Services, Infotech, Wipro, Cognizant, and Infosys dominate India’s IT sector, the country also houses a large number of small and medium size (SME) players that contribute to over 30 percent of the country’s IT exports. While SME service providers have their own focused, niche IT segments, the larger multinational companies (MNCs) offer a wide range of services in multiple verticals, including infrastructure management and business support services. 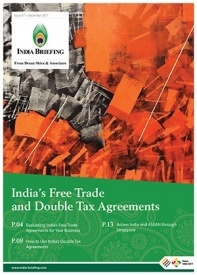 Indian MNCs have a presence in over 60 countries, and account for about 70 percent of India’s total IT export revenue. According to the industry body – National Association of Software and Services Companies (NASSCOM) – IT exports from India will exceed the US$330 billion by 2019-20. 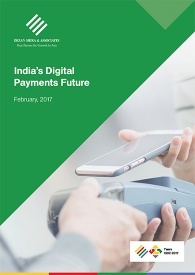 This accounts for nearly 14 percent of the projected world-wide spend if India maintains its current share of the global offshore IT market. Below we highlight what makes India an attractive IT investment destination, and why is now the right time to enter the Indian market for foreign SMEs. India has a strong mix of young and technically trained professionals. Government institutes such as the Indian Institute of Technology (IIT), the Indian Institute of Management (IIM), and the Indian School of Business (ISB) are known to produce high quality STEM (science, technology, engineering, and math) talent with diverse business skills. These professionals not only offer wage arbitrage to companies, but also enable the industry to address growing domestic and global opportunities in digital transformation, while maintaining high productivity rates. In the year 2016, over six million graduates were estimated to have been added to India’s total labor force, over half of whom have skill sets that are well suited to the IT sector. Customer Operations Performance Centre (COPC) certification that confirms the ability to deliver quality software development on time. In fact, over 75 percent of the world’s CMM (level 5) certified companies are Indian. India also has one of the highest number of ISO-9000 certified software companies in the world. The quality and cost of services are two key variables that makes India the most preferred sourcing destination in the world. India can help companies generate cost savings between 40 and 60 percent, depending on the type of services offered, in comparison to leading software markets like the US. For instance, hiring a software developer costs between US$50 to US$150 an hour (depending on the tool being developed) on average in the US, while they can be hired for as low as US$15 to US$45 an hour in India. This pricing flexibility is particularly important for SMEs in the sector as they are able to operate more efficiently on competitive budgets and gain larger profit margins on final products. 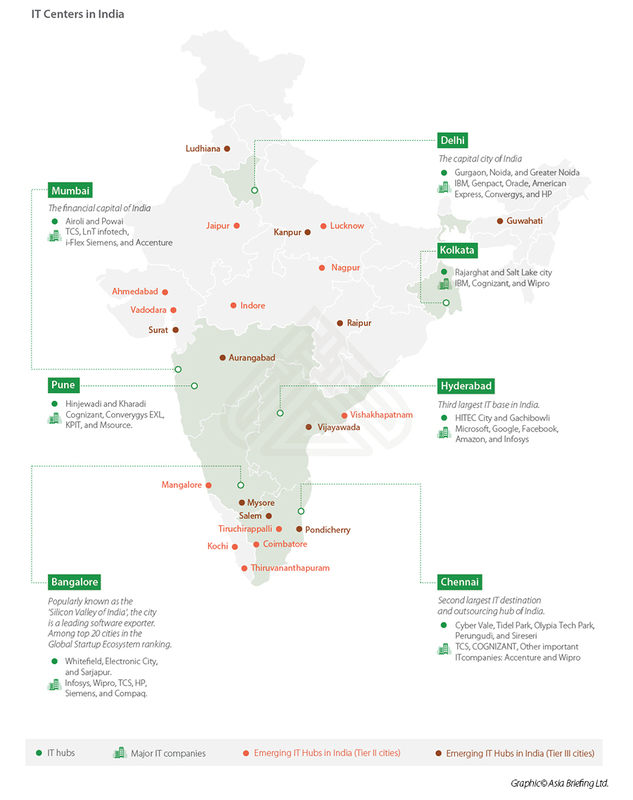 As basic infrastructure improves across the country, the geographical spread of IT companies in India is expanding to cover lower tier cities, such as Ahmedabad and Surat (Gujarat state), Bhubaneshwar (Orissa state), Chandigarh and Ludhiana (Punjab state), Coimbatore (Tamil Nadu state), Jaipur (Rajasthan state), Kochi and Thiruvananthapuram (Kerala state), Mangalore (Karnataka state), and Nagpur (Maharashtra state). Lower labor costs, affordable real estate, and the establishment of software technology parks (STPI) and Special Economic Zones (SEZs) in these cities are attractive for IT companies. Lower tier cities have given rise to a domestic hub and spoke model wherein tier I cities are hubs with a network of tier II and III spokes. The model allows organizations to diversify their operations to tier II and III cities at low costs while maintaining their high profile business clientele in tier I metro cities. 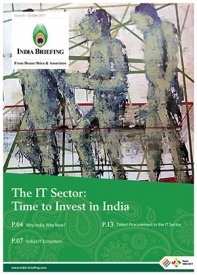 The Indian government has adopted a framework of policies that offer advantages to the IT outsourcing industry. These include national policies, financial incentives, and the development of infrastructure, which complement the local state-level initiatives targeting the IT sector. At present, the government’s Digital India campaign is injecting US$20 billion in investments to improve internet infrastructure in the country, and facilitate online payments systems and e-governance, among other things. The Startup India campaign, meanwhile, supports technology startups that are seen as critical to the growth and development of the technology industry’s SMAC capabilities. SMAC stands for social media, mobility, data analytics, and cloud computing, and India’s over 4,000 startups are at the frontier of this innovation in the rapidly transforming IT landscape. 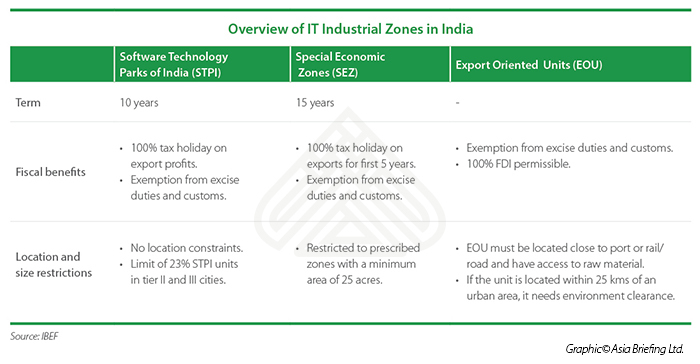 IT firms in India can take advantage of fiscal incentives offered by the government to Export Oriented Units (EOUs), STPIs, and SEZs. Further, the government provides a reduction in the tax rate on royalty and fees from technical services from 25 percent to 10 percent. Aside from establishing software technology parks, the federal State Wide Area Networks (SWANs) scheme has established networks across all 29 states and six union territories, with a minimum bandwidth capacity of two Mbps, and at a total cost of US$512.69 million. For foreign SMEs looking for a cost-effective IT destination, now is the right time to invest in India. 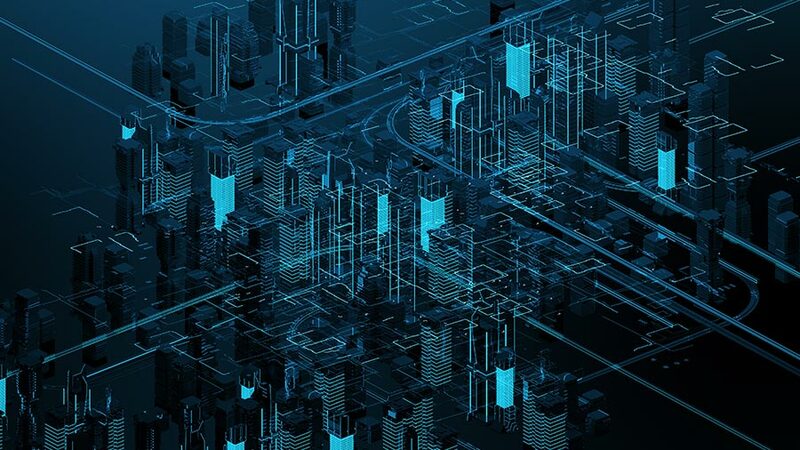 The sector is in the middle of an exciting flux as new technologies are becoming mainstream, creating further demand to match increased service competencies. Once the Indian IT sector consolidates its business, training, and infrastructure along SMAC lines, they will be able to compete with global MNCs as full IT service providers, rather than just maintenance providers and back-end support providers. In 2017, NASSCOM reported that the sector showed a 10.5 percent growth focus on developing high-end services. 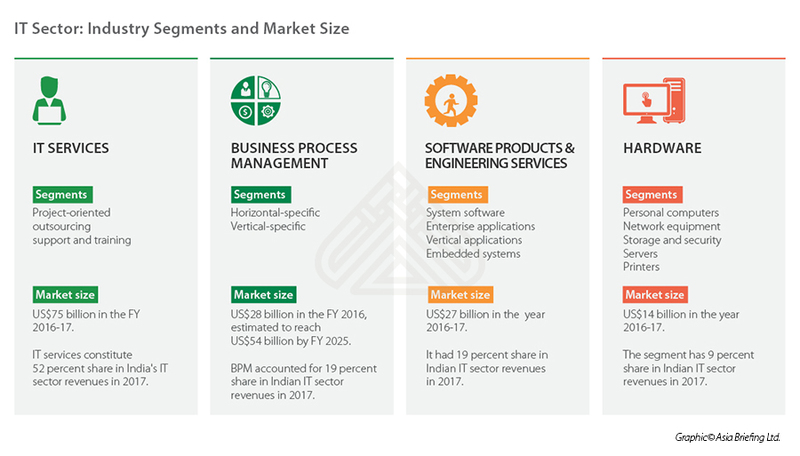 Consequently, new niche segments are accelerating the overall expansion of India’s IT sector capabilities, creating new digital solutions and technology verticals that serve industries as diverse as healthcare, finance, transportation, and manufacturing. Across the Indian economy, organizations are now spending up to 45 percent of their IT budgets on optimizing traditional IT infrastructure, developing high-skilled talent, and innovating digital processes to make their business adaptive and resilient. This R&D disruption, however, has entailed necessary and interim layoffs in the sector, as it upgrades to the next development stage. 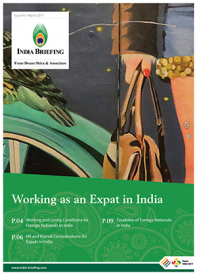 Foreign companies engaged in providing back-end (outsourcing) services can effectively tap into excess labor in the Indian market, at a competitive cost. Meanwhile, the country’s IT ecosystem will continue to develop, including the associated education and training sectors, providing foreign entrants the upper edge they need in the global market.